Finnerty has helped the IU return as a national contender. Ray Looze, Drew Johansen, Vini Lanza and Andrew Capobianco all received awards. IU claimed three individuals titles from victories at the NCAA championships. The night was highlighted by IU's 400-yard medley relay victory. The IU 800-yard freestyle relay team finished fourth in night one's only event. The 2019 Big Ten champions face top opponents in Texas in their quest for a NCAA title. 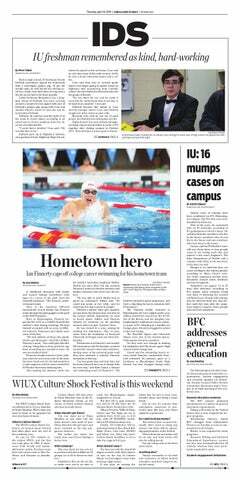 Underclassmen will lead the IU's breaststroke as its greatest ever swimmer departs. Lilly King and Jessica Parratto wrapped up their college careers. IU comes into the night in 11th place in the team standings. IU has eight more points than last year at this juncture of the meet. 17 IU athletes will go to Austin, Texas to compete for a national title. IU also has 10 swimmers headed to the NCAA championships. The sixth-year diver won two events at the NCAA Zone C Championships. IU will have the Big Ten's largest group, and the third largest in the nation. This is the third straight Big Ten title for the Hoosiers. IU will head into the final night on track to win a third straight Big Ten title. IU won the 400 medley relay, 200 individual medley and 1-meter dive.